Analysts disagree on whether the decades’ old conflict over control of the Kashmir region between India and Pakistan inspired the attacks in late November in Mumbai, India, or whether the objectives of the fighters go beyond the disputed region. 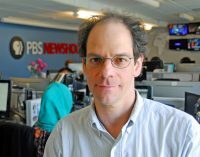 Dan Sagalyn, deputy senior producer at the NewsHour with Jim Lehrer, examines the differences of opinion in this Reporter’s Podcast. Listen to Alex Nyerges, director of the museum, describes Tiffany’s importance. DAN SAGALYN, NewsHour with Jim Lehrer: The recent attacks in Mumbai, which left 171 dead are renewing international attention on Kashmir, the disputed territory between India and Pakistan. There is considerable debate over whether the half-century-old conflict was one of the root causes of the carnage. India accuses Pakistani-based leaders of the Lashkar-e-Taiba terrorist group, or LET, of masterminding the attacks and for providing training and logistical support to the 10 terrorists. LET, or Army of the Pure, was formed by the Pakistan intelligence service and militants in the aftermath of the Soviet withdrawal from Afghanistan. Its aim, to expel India from Kashmir. Vijay Prashad is chair of South Asian history at Trinity College. He grew up in India and writes extensively about its politics. VIJAY PRASHAD, Trinity College: When that war began to wind down, by the late 1980s and into the 1990s, it had of course produced a battle-hardened group of people who were not ready to give up the fight, and indeed believed that they had with their actions defeated the Soviet Union and should take their skills elsewhere. The section of people that had come from Pakistan, in 1991 some of them, in Kunar province, Afghanistan, created a group called Lashkar-e-Taiba and their idea was to take their Afghan experience into the conflict around Kashmir. DAN SAGALYN: The sources of Indo-Pak tension over Kashmir date back to 1947. When the British withdrew from India, the native ruler of Kashmir and neighboring Jammu decided to join India, countering widespread expectations that the largely Muslim region would join newly created Pakistan. India and Pakistan have been fighting over Kashmir ever since. Today approximately, one-third of Kashmir is controlled by Pakistan, the rest largely by India. According to reports, in the midst of Mumbai melee in late November one of the terrorists called an Indian television station to complain that Kashmiris were treated badly by Indian soldiers. To Seth Jones, an analyst at RAND, the failure to settle the Kashmir dispute is one of the root causes of the Mumbai attacks. SETH JONES, RAND Corporation: The biggest issue hanging over the Mumbai attacks is the dispute between the Indians and Pakistanis over Jammu and Kashmir. As long as there’s conflict, there will be a major interest from the Pakistani side and the Indian side to support proxies — organizations operating on that front — and that will continue to lead to issues like Mumbai. DAN SAGALYN: But Vijay Prashad says the terrorists’ references to Kashmir were not sincere. He compares the Mumbai attackers to insurgents in Iraq. VIJAY PRASHAD: This is not really about Kashmir. If it were about Kashmir, groups like Lashkar would have some kind of program for how to deal with the Kashmir issue. What has occurred with these groups is their strategy, their tactics and indeed their entire vision is all violence. There is no program for the transformation of Kashmir, the seizure of power, what they would do — nothing. It’s entirely a politics of resentment and hatred. So Kashmir exists, but I don’t believe that this is really about Kashmir. DAN SAGALYN: Other analysts see it slightly differently. Touqir Hussain, a former Pakistani diplomat, agrees there may be no direct connection between the Mumbai terrorists and the half-century-old Kashmir dispute. But resolving the Kashmir conflict will reduce the support that groups like LET have in Pakistan says Hussain, now an adjunct professor at George Washington University. TOUQIR HUSSAIN: Their objectives have gone well beyond Kashmir now. They have started off in the context of Kashmir with patronage of army and the ISI 20 years ago. But I think now they’re on their own. They have an emotional support among at least some sections of the population because of service to jihad that they are doing. And especially after the war on terrorism which has angered Muslims across the board because they feel their religion is under siege and anyone who stands up to America or America’s friends like India is perhaps doing a service of Islam. But that’s not to say that Kashmir should not be solved. I think Kashmir must be solved because by solving it that will undercut public support and public sympathy for them. DAN SAGALYN: In 2004, India and Pakistan began a dialog on a wide range of issues, from economic cooperation, and water rights, to Kashmir and confidence-building measures, which are actions aimed at reducing mistrust and fear of attack. Before the Mumbai attacks, relations between the two countries were improving. However, Touqir Hussain says the talks weren’t going anywhere because India was not forthcoming on Kashmir. TOUQIR HUSSAIN: India went about the whole issue in a very disingenuous way. They thought if somehow they could disengage Pakistan from Kashmir by asking the United States to put pressure on Pakistan not to interfere in Kashmir that will solve the Kashmir problem. But that has not happened. The Kashmiris thought alright we will give the Indians a chance, but Indians then became kind of smug and very opportunistic and they didn’t give the Kashmiris any concessions. Actually, if you look at the whole dialog, progress has been made only in those areas like confidence-building — areas where Pakistan has given concessions. Where India was supposed to give concessions in order to move forward like Kashmir, nothing has happened. If Indians want peace and stability in the region and also want Pakistan’s serious support against terrorism, extremism, they have to placate the Kashmiris, give them some better deal within India. DAN SAGALYN: To professor Sumit Ganguly, these talks were making headway on resolving the Kashmir dispute before the Mumbai attacks. But going any further will be almost impossible now, says Ganguly, professor of Indian cultures and civilization at Indiana University, Bloomington. SUMIT GANGULY, Indiana University, Bloomington: There has been considerable progress on Kashmir in the last few years. Since 2004 there has been a ceasefire between India and Pakistan, which for the most part has held. Subsequently, India and Pakistan in 2006 agreed to new bus service, linking the two respective capitals of Kashmir. There have been greater people-to-people contacts subsequently with greater issuance of visas. So the suggestion that the Kashmir conflict is going nowhere and is in a state of stasis or there is a stalemate or a deadlock and hence, dramatic action was necessary to arouse public consciousness about Kashmir is a laughable proposition. And furthermore, the notion that India should negotiate on Kashmir when its principle commercial, entertainment and economic capital has been attacked in this brutal and cruel fashion I think is a morally irresponsible position. DAN SAGALYN: While dialog over Kashmir has dragged on, the approximately 16 million people who live there have soured on the prospects of being part of either India or Pakistan, according to Ghulam Nabi Fai. He’s the director of the Kashmiri-American Council, a pro-Kashmir organization in favor of self-determination. GHULAM NABI FAI, Kashmiri-American Council: According to a survey done by Hindu Times, CNN/IBM, 87 percent Kashmiris want independence. But when I say independence, I do not mean independence only from India, I mean they want independence from both India and Pakistan. And secondly, what was interesting was another survey, and that survey was released on Nov. 5, 2004, 78 percent of people of Kashmir want independence. So in other words, every single day passes, the sentiments toward freedom, the sentiments toward independence, they are on the increase. DAN SAGALYN: During the presidential campaign, President-elect Barack Obama said the United States should help solve the Kashmir despite, so that Pakistan could focus on confronting the Taliban and other militants. PRESIDENT-ELECT BARACK OBAMA: The most important thing we are going to have to do with respect to Afghanistan is actually deal with Pakistan. And we’ve got to work with the newly elected government there in a coherent way that says terrorism is now a threat to you. Extremism is a threat to you. We should probably try to facilitate a better understanding between Pakistan and India and try to resolve the Kashmir crisis so that they can stay focused not on India, but on the situation with those militants. DAN SAGALYN: These remarks created considerable stir and anger in India, where external pressure is dreaded. Pakistan, for its part, welcomed Obama’s attention to the long-simmering issue. Whether or how the new president acts on his campaign statement remains to be seen. For the Online NewsHour, this is Dan Sagalyn.